How will you inspire your teams to succeed? You want every student to receive the best education possible. It’s a big goal—but we can help you achieve it. At Solution Tree, our experts are committed to providing your teams with career-changing training and proven solutions to ensure learning for all. From Richard DuFour and Mike Mattos to Anthony Muhammad and Cassandra Erkens, you can be assured our PD is research based and effective. We cater to your needs by offering a range of services and tools to help you where you need it most. For nearly 20 years, Solution Tree has provided educators with professional development that has inspired meaningful outcomes for students. 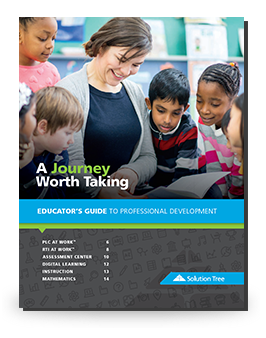 Take the first step of your PD journey by claiming your FREE Educator’s Guide to Professional Development. Within its pages you’ll find the direction you need to empower your teams, strengthen schoolwide practices, and increase student achievement. Start Your PD Journey Today! Take the first step of your PD journey by claiming your FREE Educator’s Guide to Professional Development. Please complete the form below to access your free content. Yes, I want to receive information from Solution Tree about professional development opportunities.